Warsaw is where GE engineers research and develop products and processes of tomorrow … and where world champion skiers train. When you step outside on Krakowska Avenue and leave behind the gates of GE’s Engineering Design Center (EDC) of Warsaw, you realize the unique experiences such a place provides. It’s not easy to find a technology center that presents such singular features, structures, population and remarkable heritage. And even if this center has existed with the name of EDC for 17 years, its history starts much earlier at the beginning of the 20th century, in a country that carries a tradition for science and studies. Poland is the native land of the first and only woman to win two Nobel Prizes, Marie Sklodowska-Curie, one for Chemistry and one for Physics. “Between the end of the of First World War and the beginning of the second, this was a Government’s research center mainly dedicated to the aviation industry; Poland was among 10 countries worldwide able to export airplanes. The Polish industry was capable of manufacturing both aircraft and engines,” said Jakub Kulecki, senior engineer for LEAP High Pressure Compressor Airfoils, who is like an encyclopedia for the EDC. He knows almost everything about the long history of this place that stands near the Fryderyk Chopin airport, confirming its aviation roots and where other aviation factories still lie. During the German occupation, a significant portion of the center’s surroundings were bombed or demolished, and the current facilities of the Institute of Aviation became a maintenance and repair station serving the German army. After liberation, the center restored its capabilities of design, testing and development, with a manufacturing plant PZL (Polish Aviation works) Okecie beside it. “But the management under the communist’ regime was too centralized and therefore inefficient. At communism’s sunset, the industry lacked capital. Thus, the national manufacturing plants were sold to foreign companies,” Jakub said. If you walk the streets inside the EDC, you can still see what remains from previous era, including amazing models of numerous aircraft that ruled the sector all along the 1900s: like the TS-8 Bies (Devil) basic trainer, the legendary PZL-104 Wilga, and even a Mi-2 helicopter, which was produced at a volume of about 350 units per year. In 1990 when the Berlin Wall came down, Poland’s economy was suffering. According to Jakub, GE as impressed by the EDC’s potential. The company decided to invest and establish a public-private partnership with the ILOT Warsaw Institute of Aviation, the Polish national institution that owned the center at that time. EDC occupies more than 12 thousand square meters of space, with 20 buildings and 1,800 employees. Inside these buildings are laboratories, test rooms, classrooms and offices. It’s like a massive university campus where research and development are directly connected to the industrial world. “Additive and digital revolutions come together as we support all of GE’s businesses at the EDC,” adds Lubieniecki. This statement couldn’t be more true when discovering the numerous projects that various engineering teams are supporting. At the EDC, engineers work every day to find new ways for production processes, trying and experimenting operations both for manufacturing and service activities in all sectors, and of course designing and prototyping new ideas for GE’s current and future products. The use of additive technology is pure excitement for the engineers here. Marcin Kubać describes the Additive Mechanical Design team he leads: “Our team develops and experiments with additive manufacturing for parts across the entire LEAP engine and, actually, additive activities are just a portion of the larger LEAP design team at EDC. 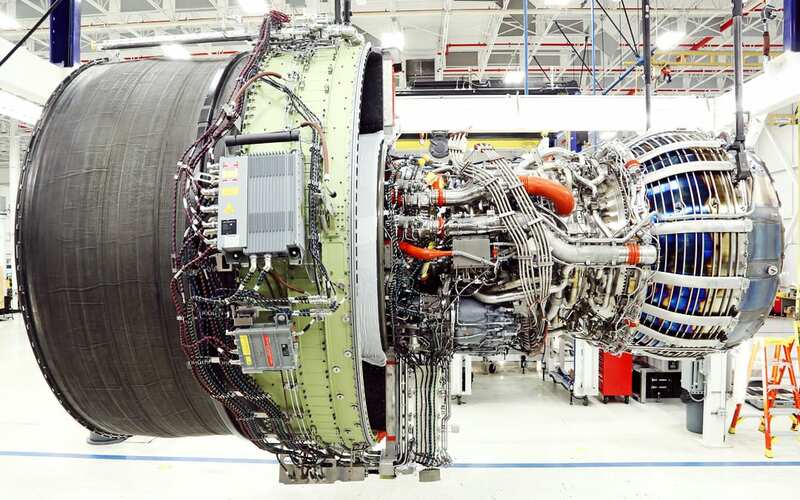 In particular, we’re focused on parts of the high pressure compressor and the cooling inducer.” The best-selling commercial engine, powering the Airbus A320neo family and Boeing 737 MAX, is just one of the engine programs with which engineers at the EDC are working. Other engine programs supported at the EDC include CF6-80, CFM56, GEnx and most recently GE9X and Advanced Turboprop (ATP). Another engineer, Piotr Wiatr, section manager for Business and General Aviation (B&GA) programs at the EDC, focuses on popular engines powering regional, business and general airplanes around the world: CFE738, CT7 (T700 legendary family), GE Honda HF120 and Passport. The latter, which powers the Bombardier Global 7000 and Global 8000 jets, includes additively manufacturing components, like the air-oil separator disk. “Additive fits very well in the B&GA world because of the size of the engines. With additive, you can combine more parts together and benefit from both weight and cost efficiencies,” he says while showing us a 3D printed plastic trial of a Passport component that demonstrates downsizing 52 parts to just 25 components. Teams of engineers stay connected with each other within and across the GE businesses. For the teams supporting ATP, there’s a Design team that collaborates with the Materials Application team aimed at applying the latest material studies to actual ATP modules. Paweł Buczek and his team are responsible for the main components made in additive for ATP. “ATP is our baby… our great opportunity right now. We’re developing and facing things for the very first time, which is normal when you work on such a brand-new product. Apart from this, dealing with the complexity is exciting, and EDC is the best environment to take on this challenge,” he said from the Aircraft Engine Lab. Walking around the EDC buildings is a stimulating experience. Among the aviation labs and test rooms, there are large facilities dedicated to gas turbine and other industrial sectors research. The wind tunnel is something unbelievable with a 5 meter diameter tunnel and power that can reach up to 5 MW (enough energy to power more than 1,200 average homes). It became so renowned that ski jumping athletes like the Polish World Champion Kamil Stoch came to the EDC to train. “Ski jumping is all about drag, lift and angle of the body. Here, ski jumpers can experience limitless (but controlled) conditions to test and practice. “Of course, engineers have priority over utilizing the equipment to test GE technology,” Jakub firmly claims. Engineers come from all over the world to work at the EDC in Poland. Here, engineers study multi-sector solutions for aviation, space, automotive, construction, energy, defense, mining and even sport. It is ultimately the place to be for an engineer … or a professional skier. Great video that highlights EDC well and how you are playing in the additive game! Pawel Widlicki started his EDC career in Failure Analysis Team. FA Team is a PART of EMS Engineering Material System group, together with MAE group.